Discover ancient sites, desert landscapes and superb snorkelling on this Egypt family holiday, feluccas and pharaohs. Carefully designed to keep kids and parents active and inspired, this nine day break blends all the essential sights with plenty of off the beaten track activities for a well rounded family adventure, with time to relax, too. Explore the Pyramids, Sphinx and Valley of the Kings with expert local guides who make these celebrated sites accessible and fascinating for children. 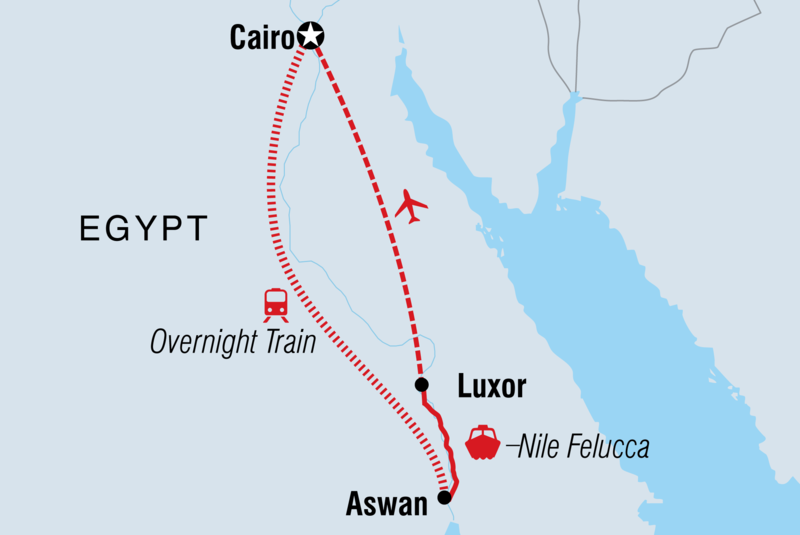 Ride the sleeper train from Cairo to Aswan, a fun adventure that’s comfortable, too. Cruise down the Nile on a traditional felucca, tucking into hearty feasts and sleeping under the stars on deck. Try riding a camel, hop on a donkey in Luxor and take a horse and cart ride to the temple at Karnak. After discovering ancient and contemporary Egypt, this exciting holiday rounds off with wonderful snorkelling and swimming in the Red Sea at Hurghada. As well as packing in Egypt’s famed monuments and temples, this holiday is careful to include lots of opportunities to meet people and experience the local culture, too. Eat dinner with a Nubian family in a house in Aswan, wander through Cairo’s buzzing Khan al-Khalili bazaar and enjoy chatting with your friendly felucca crew. It’s a perfectly balanced holiday, which blends action, adventure and relaxation. Responsible mission: As adventure travellers we relish and celebrate the diversity of the world. We also recognise our obligation to protect the environments that we explore. Our aim is to tread lightly, whilst contributing to maintain the world’s culture and nature, and most importantly to engage the help of all our customers to utilise the potential of tourism as a tool to aid sustainable development. We believe that responsible travellers are welcome in the places that they visit. On this trip: We travel in small groups (max 16 people) so have a minimal impact on the environment as we go. On this trip we use a local agent from Egypt, locally owned hotels, local leaders. Not only does this mean that more of the money we generate stays within the community, but their local knowledge and expertise helps us to better understand the environment in which we are travelling, whilst reinforcing within the local community that preserving this environment is both important and worthwhile. During your stay: A trip designed for those who want to explore and have adventure, but not at the expense of the local residents. Many visitors to Egypt do not realise that using luxury cruise boats that are little more than 'floating gin-palaces' creates problems and provides almost no benefit for the ordinary people of Egypt. Cruise ships create river pollution and erosion and affect the livelihood of local fishermen. At the same time very little tourist money actually gets into the hands of local people. We get right down to grass roots level on their trips and travel by traditional forms of transport - sailing by felucca, riding the local train and potentially a camel trek. We also eat an evening meal with a local Nubian family in Aswan. Clients are advised on minimising their impact on the environment and culture - our leaders ensure that rubbish is either buried (bio-degradable) or carried out after the river trip, to be disposed of sensitively and that clients are aware of local issues - religion, customs, sensibilities, how to dress etc. We have also joined forces with the Sunshine International Project, Luxor, to assist in providing education and a home for children in Egypt. You will have the opportunity to visit the home during your stay in Luxor, and meet the 68 residents - aged between two months and 11 years old. You’ll be assured of a cheery welcome! If you would like to give a gift they would be delighted to receive the following; pyjamas, disposable nappies, milk formula & baby shampoo. All of these goods are available to buy cheaply locally (helping the local economy) and your group leader will be able to advise on where to buy things.